- Fixed file data import demo. - Added options change link social on page single product. - Added change background images home page 3 on Visual Composer. - Fix bug css mobile and tablet 3 home page. - Update plugin premium : Revolution Slider and Visual Composer. 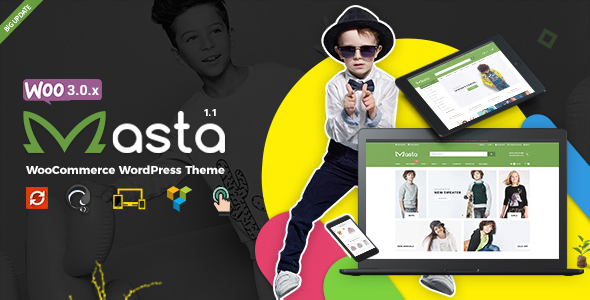 If you are looking for a professional baby shop for online business, Masta – Baby Shop WooCommerce WordPress Theme will bring you many things that you looking for. Unlike other themes which support responsive layout only, after purchasing our products you have just installed the interface to sale immediately. With Masta you can easily set up many things at one time that helping to save a lot of time by just one click : one click to install plugins, one click to install PRE-MADE WEBSITE and done! You can select products to buy without leaving the current page, instantly a product to the basket as well as the wish list or compare product. More and more style category products for you to choose. Blogs style custom in the backend is easy to use. We have created some useful single product with 2 statuses Cloud Zoom and Light Gallery that make visitors love to browse your site. This is necessary for some busy customers because saving much time, they’ll immediately approach to your message and make the decision in seconds! We have included 18 amazing element visual composer to suit any of your purposes. Especially, you can easily customize your website in yourself. Now, you can start building your dream website with these. Masta has made SEO optimization so your site can be ranked fist by search engines. Also, you can easily customize the meta description content in the administrator. For a more convenient shopping experience, customer can view your product details in a popup, without navigating away from the current page. It also has ready for compase, Whish list, countdown product in Masta Baby Shop. Showcase your products in a new lookbook style that displays collections in an editorial-style spread. Поделитесь этим материалом. Выберите свою платформу! Жизнь — она всегда такая разная.